Nestled conveniently only minutes from Donaldson’s Cross roads, route 19 and Interstate 79, Majestic Hills is the first neighborhood in the South Hills designed with a site planning method known as coving. Driving along the curved roadways you will notice the landscape architecture that includes flowered rock focal points which complements the with wide-open views. It is easy to see the difference within this community of single-level custom homes. 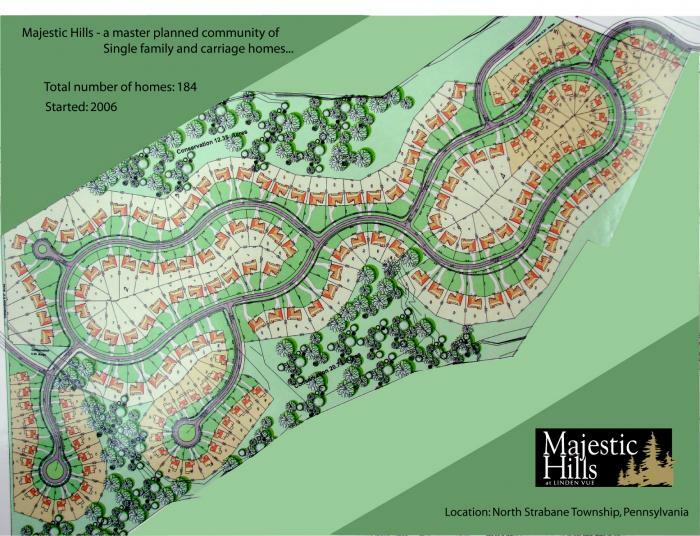 Destined to be another design winner, Majestic Hills is now being constructed in North Strabane Township. Phase 2 homesites are now being offered. Well priced/valuable home sites, are going fast. Reserve yours today! The homes in this new community are being constructed Ryan Homes. For more information on Ryan Homes please go to www.ryanhomes.com. Click on the brochure link to the right to see a sample of the floor plans being built. © 1998-2019 JND Properties. All rights reserved.